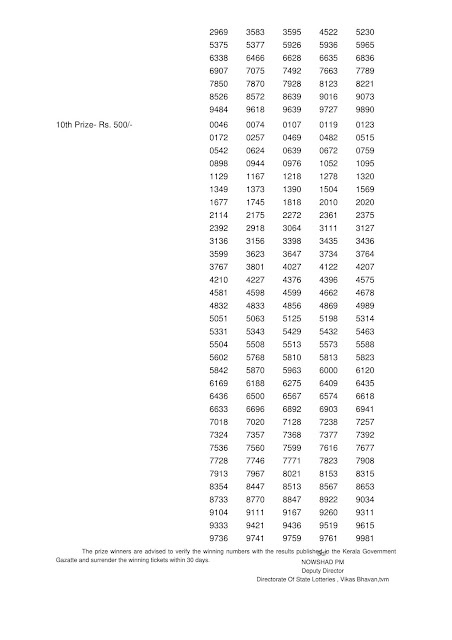 Kerala lottery Result of "THIRUVONAM BUMPER-2018" lottery draw number (BR-63) on 19 September, 2018 is Published below. 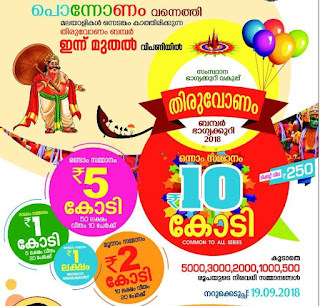 "Thiruvonam Bumper - 2018" is also known as "Onam Bumper - 2018". Kerala lottery bumper draw today on 19.09.20107 is of Thiruvonam Bumper-2018 (BR-63) on September 19, 2018. 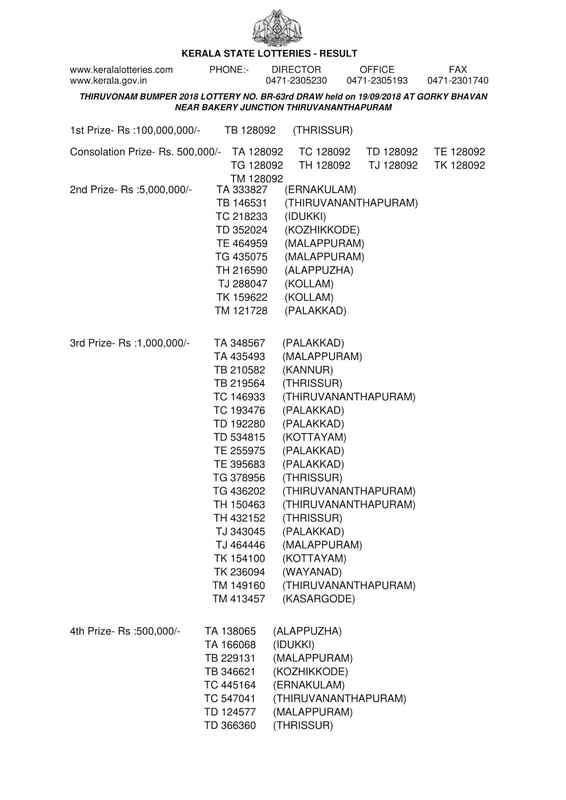 2018 by department of state lotteries official website We are publishing two formats of results today on 19.09.2017 of Thiruvonam Bumper-2017 above. Today the draw of Thiruvonam Bumper-2018 starts at 2:00 PM. Live Kerala lottery result numbers are announced in the venue itself. 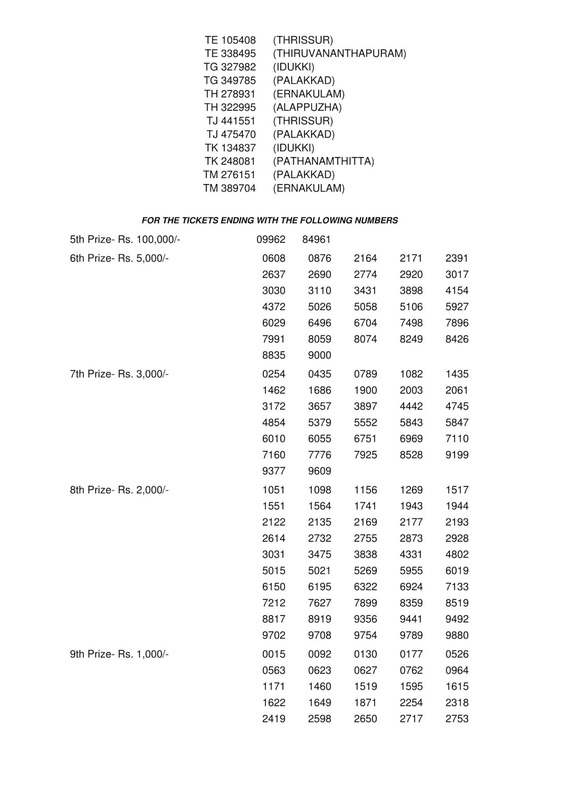 Complete result will be available by 3:00 PM.The First Prize of Thiruvonam Bumper-2018 lottery is rupees 10 Crore. It is the ever hightest first prize offered in a Kerala lottery draw. Last Thiruvonam bumper also carried the same first prize. 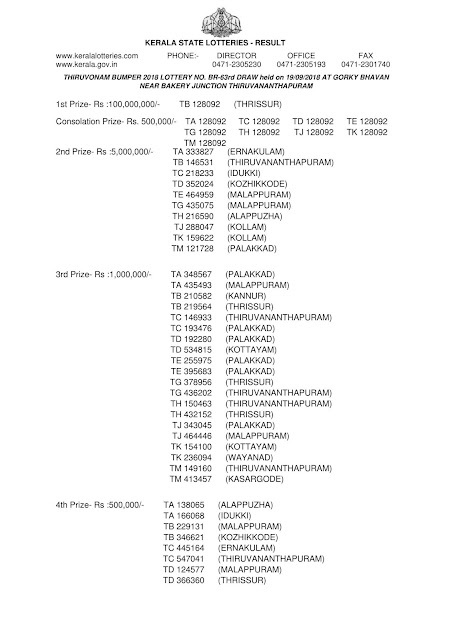 It is the highest prize ever in the history of Kerala Lotteries. There are 3,05,3400 prizes in 10 slabs. Cost of a ticket is Rs.250/- rupees two hundred and fifty only (including GST). Onam bumper (Thiruvonam Bumper) is conducted in the month of September of every year related to the Onam celebrations in Kerala. A total amount of Rs.65,11,50,000/- is disbursed in 3,05,340 prizes. An amount of Rs. 6,51,15,000/- is paid out as Kerala lottery agency commission.